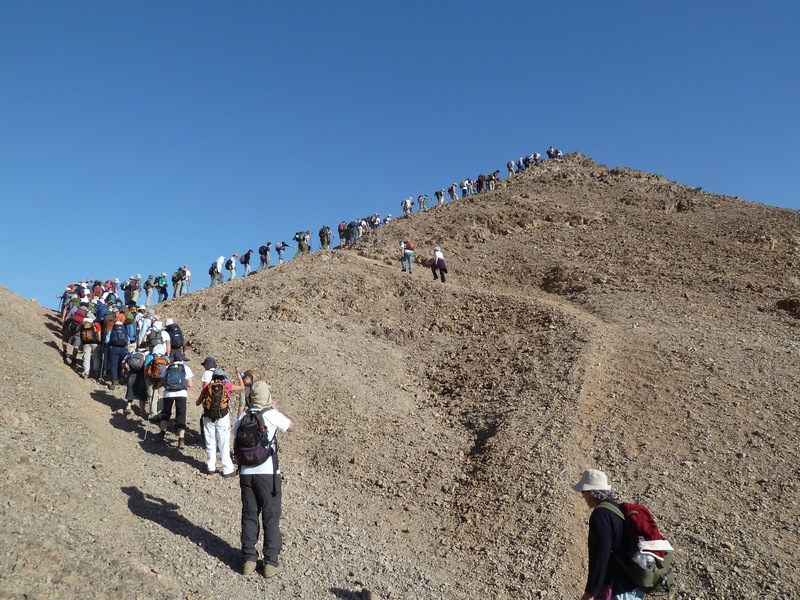 The Israel Trail or Shvil Yisrael is a national hiking trail inaugurated in 1994 that zigzags the entire country from Tel Dan in the north near the Lebanese border to the southernmost tip of Israel at the Red Sea, approximately 940 km. You may have seen sections of the trail on other hikes (the Israel Trail was created by connecting some of the existing, favorite hiking trails), for example, if you’ve visited the Small Makhtesh from the western lookout point the trail descends and crosses to the mouth of the makhtesh and then north via Maale Hatzera. You can recognize the trail by its 3 colored stripes, white (signifying the snow on Mount Hermon, north), blue and orange (like sand or south to Eilat). I have Zvi Gilat’s excellent guidebook to the Israel Trail in Hebrew; there is one guide book, Israel National Trail by Jacob Saar, including topographical maps in English. The official website is at http://www.israelnationaltrail.com/ which includes a forum that enables you to connect with other hikers to discuss the trail. 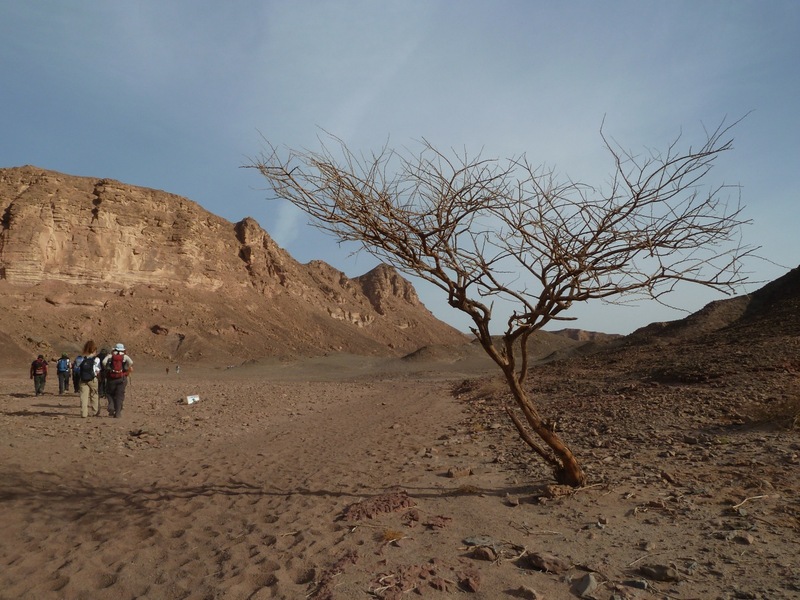 I just got back from 8 days hiking on the southern part of the trail from the border crossing with Egypt at Taba to Shaharut in the Negev (incommunicado with the outside world, walking the desert landscape – which is why there was no blog post). Walking for a number of hours through a narrow canyon, climbing a ridge or mountain for a 360 degree view of your surroundings and watching the changing forms of the sandstone cliffs as you hike by is a different experience than driving up to a site by car. 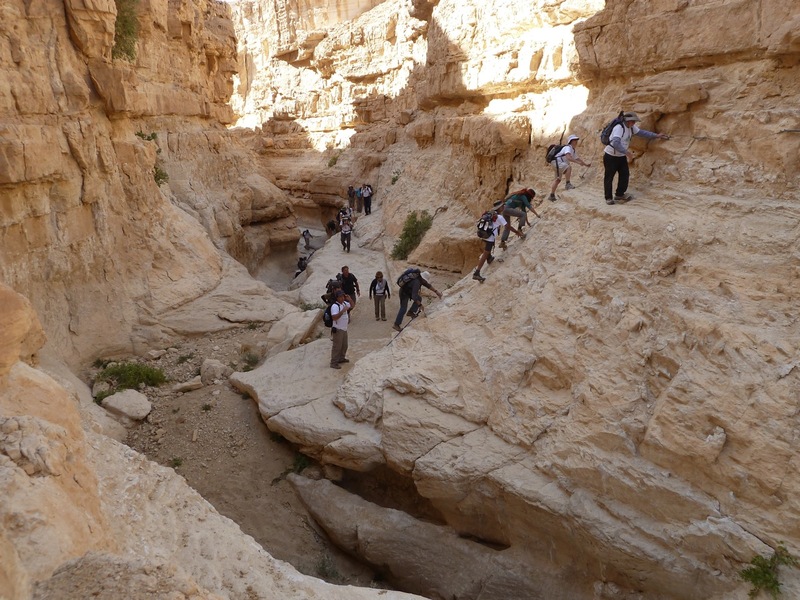 The trail lets you experience nature throughout Israel with the opportunity to relate to the history of the country. I joined the annual Avi B’shvil Yisrael, an incredible project that brings together a third component, encounter with Israelis from throughout the country, young and old, religious and secular. There is a daily group discussion about the significance of kibbutz and an evening guest who talks about his/her experience related to kibbutz (the subject being examined this year). They also handle a lot of the logistics, you can pay 10NIS for fresh fruit, vegetables and bread to have for lunch and 10NIS for a communal dinner, the organizers ensure that there is enough water for the next day, provide a guide and arrange transportation (back to where you left your car, car pooling or a main road where you can get a bus). They are hiking the Israel Trail until Thursday, April 28, 2011 when they reach She’ar Yeshuv so if you can find the time, check out the itinerary at http://www.avi-beshvil-israel.org.il/luz.php and join them. I strongly recommend it. The project is in memory of Avi Ofner and 72 other soldiers who died on February 4, 1997 when two IDF Sikorsky CH-53 helicopters collided in midair over She’ar Yashuv. The helicopters were hovering waiting for clearance to cross the border into Israel’s “security zone” in Lebanon. This entry was posted in Hiking, Nature and tagged Arava, Eilat, hike, Hiking, Israel Trail, nature, Negev, postaweek2011 on March 11, 2011 by Shmuel Browns.